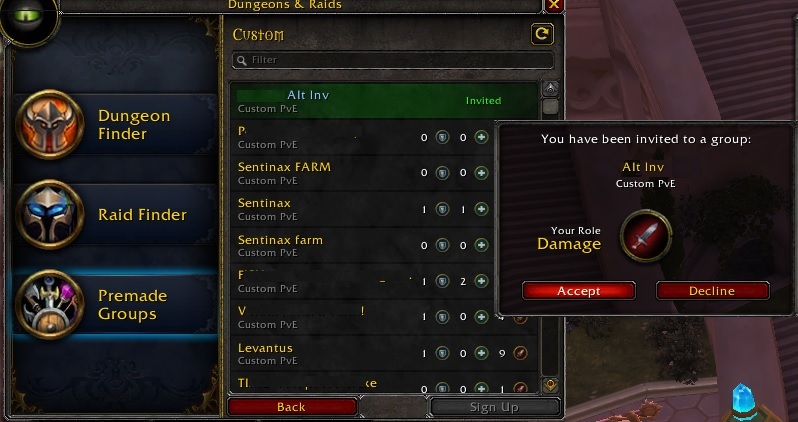 We all know how annoying it can be when you’d like to do your weekly raid mount farm, but there’s no guildie or friend online to invite your alts in the group, along with your raid lockout saved character. Well, what if I told you can actually invite all of your alts in the group, all by yourself, without requiring a second account or another player? Awesome, right? Let’s get right to it! The first thing you require is to have at least a level 90 character (provided you only farm raids up until level 90), with lockouts in every raid, right at the boss you want to farm. Now, for a more efficient run, this is a character on which you won’t be killing those bosses, ever, granted you have more than a couple of alts. You’ll merely extend the lockout every single week, after the weekly reset. Let’s name this character as “1”. After you’ve created the group, make sure to check “Auto Accept”, which means that everyone who applies to this group (namely your alts), will be automatically invited. Furthermore, while still on your “1” character, after the group was created, make sure to right click on your portrait, and under “Instance Options”, click on “Convert to Raid”, since you’ll be needing raid difficulties anyway, even if you have less than 5 alts overall. After the above steps were met, simply log out of your “1” character, while the group is still created, and log into any other alt you’d like to invite in the party, which we’ll name “2”. 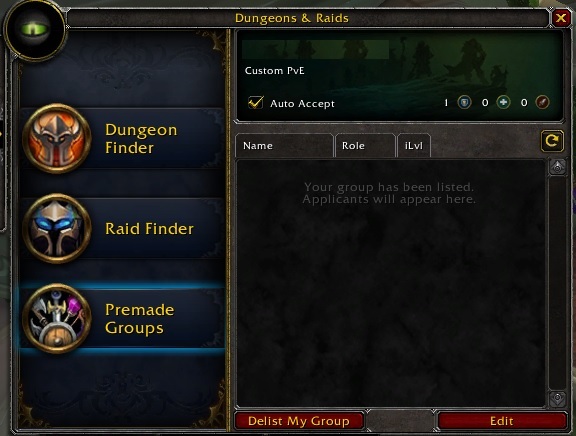 On your “2” character, go to Group Finder (default “I”) -> Premade Groups -> Custom, and you should already see the first group in that list, colored as blue, which means a “friend”, namely your “1” character, is in that group, as opposed to the default yellow text. Click on that group and press “Sign Up”. You’ll be automatically invited to join that group, where only your “1” character is so far. After this “hardest” part is done, you simply need to repeat this part on every other character you’d like to invite to the group. So just log out of your “2” character -> log into your “3” one -> Sign Up -> get invited -> log out -> bring your “4”, and so forth, until all of your alts are in the group. Don’t worry about the group leader being your “1” character, as by the time you invite all of your alts, it’ll be passed to the character you’re currently online on. Now you have all of your characters in the same group, and you’re locked to the very boss you want to farm! 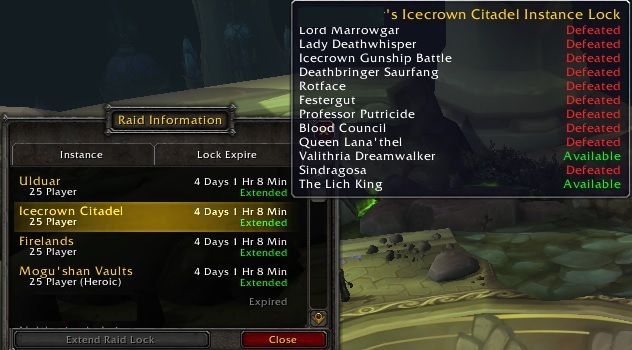 The best and most efficient way to farm the raids, provided you’re farming Icecrown Citadel, Ulduar and Firelands, for example, is to do all 3 raids on every character at one time, thus being able to leave party with your “1” character once you’ve finished all 3 raids. Afterwards, log on your “2” character, right click on your portrait and under “Instance Options”, make sure to click on “Reset all instances” to have the lockout back to what it is on your “1” character, and repeat the process of clearing the remaining raid bosses and logging your other characters. This is pretty much it! Make sure to leave a comment if you’d like to share a suggestion or just to show off your mount drop! 😀 Best of luck! P.S. 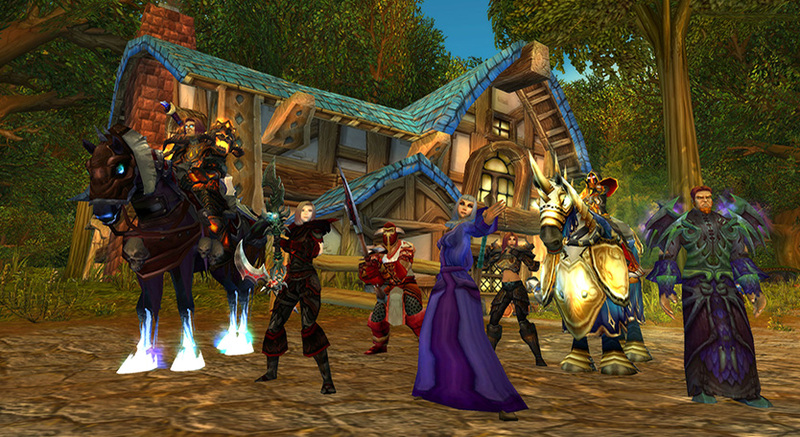 : Ring of the Kirin Tor can save you quite some time when your Heartstone is on cooldown!